Now that Halloween is over with and it's time to whip out the holiday decorations, I thought I'd add some snipets of delicious food and recipes that I come across. Not all necessarily Italian recipes but some dishes I may try for our American Thanksgiving feast here in Italy. 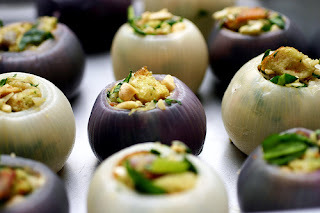 Check out this 'roasted stuffed onion' sidedish from Smitten Kitchen. Paris is the new pink.